We have the most prims for you! « More Bonus Levels for our most loyal Residents! Get your land ready for the holiday season! As every year, we’d like to remind you before you leave for holiday season and spend some special days offline with your real life loved ones, to pay up your parcel(s) before you log off for a while, to not find your land taken back when you return and your home/business gone. You can always pay as much in advance as you like. Either by using one of the 4 pre-populated buttons for 1, 2, 3 or 4 weeks (shown in red on the image below), or by entering a free amount of your choice into the field shown in the green frame on the image below. The system will automatically translate your amount into the corresponding amount of time added to your contract. Alternatively, you can also pay via PayPal or setup a PayPal subscription, to never forget a tier payment again! Simply use the corresponding option in your terminal’s payment menu. We wish you a happy season! More Bonus Levels for our most loyal Residents! Even More Prims – Now on Pumbaa! Hi! My name is Alvi Halderman and I've been creating content in SL for more than a decade. Everything from small furniture to entire regions for all kinds of purposes. This is my office where I usually meet with my friends and clients. 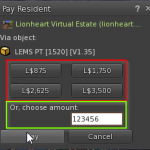 Which Option for Second Life Land Sales do you prefer? Second Life®, Linden Labs® and the inSL Logo are Trademarks of Linden Research, Inc.